The Grace Church Melbourne is holding its third annual casino fundraiser to support the children’s program at the community-based organisation South Brevard Sharing Centre. The organisation is based in South Brevard County, Florida and works towards empowering families in the region. The event is named ‘A Night in Casablanca’. Keeping up with the theme the venue of the event – ballroom at the Hilton Melbourne will transform into the Morocco of the 1940s. The casino night will include games of poker, craps, blackjack and roulette along with a poker tournament. The money used at games will be fun money and the combined winning amount will be converted into raffle tickets. Participants then can use the tickets to win many exciting prizes worth $35,000. The prizes range from a gift certificate for Toyota store in Melbourne, jewellery, a ski trip to Utah, a trip to Washington D.C. and many other prizes by the sponsors. The grand prize is a cash raffle worth $10,000 at $100 per ticket. This is strictly limited to 300 tickets. The cost for the general event is $90 and for high rollers the cost is $500. The general ticket is worth 2500 fun money or Casablanca dollars as the organisers have named the currency. This ticket also gives participants access to silent auction and a raffle ticket. 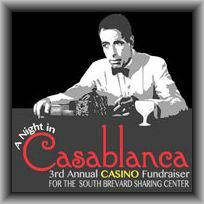 High roller ticket is worth 50,000 Casablanca dollars and comes with extras such as two raffle tickets, a chance to play at the poker tournament, dinner, silent auction early access and many other benefits. There is refreshment for all participants. The event is on 9th May, 2015 from 6.30 PM to 11 PM. Sponsorships and tickets are still available. The beneficiary program works towards feeding children in urgent need of daily meals.